After her friend left in the morning, Child Two decided to keep the fort up (it’s still there now) and in the afternoon she and I sat inside and made memory wire bracelets together. These are very easy to make. All it takes is some memory wire (so-called because it retains its coil shape), a pair of wire cutters and a pair of pliers (round-nose ones work well), and beads. Our local BigName Craft Store carries two sizes of memory wire, one just right for kids and one just right for adults. 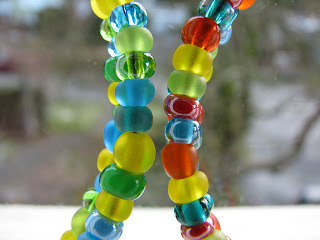 Cut the wire to whatever length you want (if someone has been pretending the wire is a Slinky—Child One, was that you?—you may have to untangle it first), curl one end with the pliers, and start beading. When you’re done, curl the other end. That’s it. 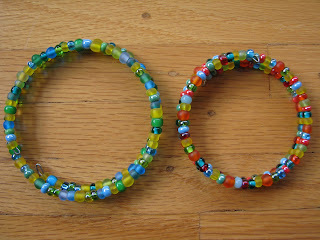 It was rainy yesterday and the day before that, so Child Two and I decided we needed some bright spring colors. What could be better than sitting in a homemade fort on a gloomy day with great company, 70s tunes cranked up on the stereo, playing with beads? By the way, we're still in search of brownie recipes and online craft stores. Leave a comment if you've got something to recommend! HEY! I have one of those that you made me and I love it. You told me it took HOURS to make, gigs up. Love the second pic with the two colored bracelets next to each other. I don't know if there is anything better than a fort in the living room.